Right now, this very moment, you don’t know it, but you are at war and the adversary is winning. Script kiddies, malicious hacktivists, state sponsored hackers and cyber mercenaries pose a critical and life altering threat landscape targeting you and your family. This isn’t some doom and gloom fear mongering enterprise; this is the new reality. Your social security number, banking information and even your health records have tremendous value and you’re offering all of this up on a silver platter to those with a malicious intent for its use. What cybersecurity mechanisms do you have in place at home to protect your family and at work to protect critical data? Do you suffer from Nephophobia? Do you know what that is? How do you analyze a link and automatically know if it carries a virus that will corrupt your computer for easy access to hackers? What is spear phishing? Is your business a potential victim of a DDoS attack? You’ve heard about Zero Days but what are they? This book covers this and much more in an intentionally easy to read and recall format so that your online activity from email and password creation to web browsing and filling out online forms can be done in a secure manner. After reading this book series, basic cybersecurity will be second nature and your newly found cybersecurity hygiene will rub off on your family and peers. 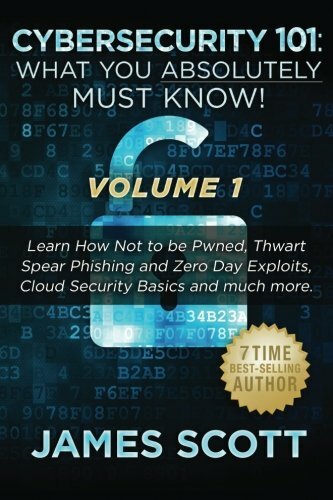 This book covers topics such as: how to defend against Pwning, common Nephephobia, how to avoid being a victim to phishing attacks, overcoming DDOS attacks, how to block Zero Day exploits, how to thwart clickjacking, how to detect and protect against Malware and much more. Online courses that cover the topics in this series sell for $100’s of dollars. The author will take your hand and walk you through these technical topics so that on the conclusion of each book, you’ll have a working and virtually automatic comprehension of its contents. The internet is here to stay and will continue to evolve. With the introduction and chaotic accelerated growth of the Internet of Things (IoT) online threats will only become more sophisticated and malicious. A baseline comprehension of ‘cyber self-defense’ is paramount and proper cybersecurity hygiene is essential to protecting yourself, your family and business from hackers and to thwart virtual threats that have gone viral. The technical components of cybersecurity can be tedious and intimidating but this book series is authored for those who aren’t tech gurus and need to learn powerful cybersecurity techniques quickly and easily without the intimidation of tech jargon or lofty terminology.